Today it is raining like crazy here in Northeast Texas. We experienced a dangerous drought this Summer and early Fall, so we are not complaining. 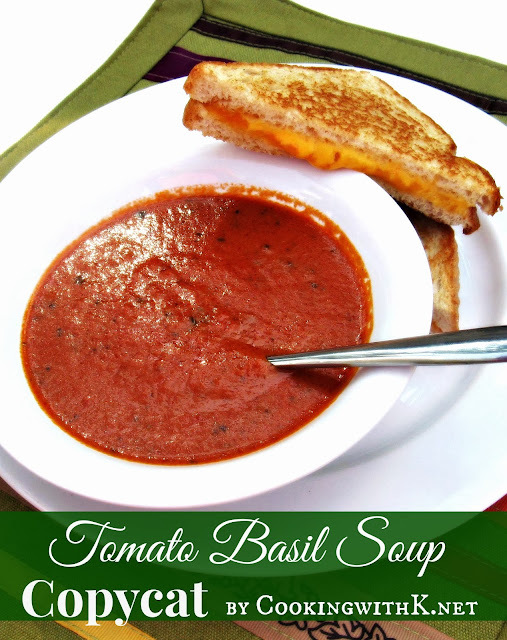 Today is a perfect day for soup and my Tomato Basil Soup is a quick and hearty tomato soup to warm you up. My favorite place to eat Tomato Basil Soup is at a la Madeleine' Country French Cafe -- so much so that I had to find out how to make it. I found this copycat recipe that is the closest to la Madeleine's so far. Their Signature Tomato Basil Soupe is available at Sam's, and I must say I do buy it occasionally, but it is pretty pricy and doesn't go very far -- so this soup is a fill in until I make it to my favorite eating place. Combine tomatoes and tomato juice (or tomato and vegetable juice combination) in a saucepan. Simmer 30 minutes. Add basil leaves and puree in food processor (or you can use a hand held blender/mixer) until smooth and thick, not watery. Return to saucepan and add cream and butter, stirring constantly over low heat until creamy smooth and all ingredients are incorporated. Cook's Note: I like using a food processor to puree, because you can better control how evenly it purees. I love tomato soup, but won't eat a raw tomato! Tomato soup and a grilled cheese, always a winning combo! It looks delicious! I, too, love La Madeleine's tomato basil soup. I've seen the recipe but have never made it. You're giving me the inspiration! Oh yum! this looks quick and easy and delish! I head for La Madeleine every chance I get and always have the Tomato Basil with a salad, I love this soup. Thank you so much for sharing with Full Plate Thursday. Hope you have a wonderful week end and come back soon! Oh Yum! Never heard of the soup and your recipe looks really good. So does your grilled cheese sandwich! Enjoy your weekend! 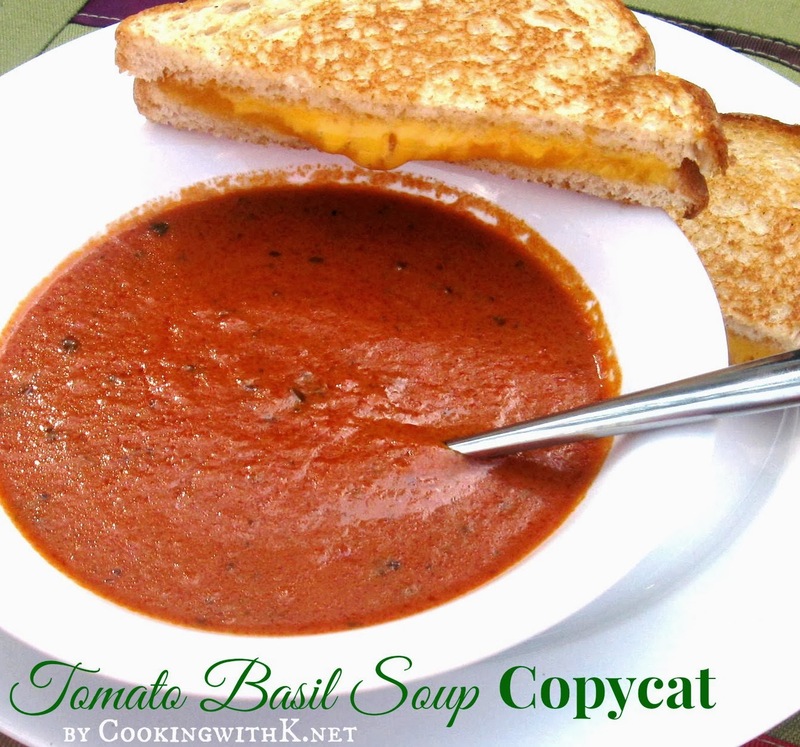 Tomato basil soup + grilled cheese = my FAVORITE cold weather meal! I have never tried to make my own, but I think I will be adding these ingredients to my shopping list for today :) Thanks for sharing! YUM!! Saw you on country mama cooks! There's nothing that comes close to a hearty homemade soup. This looks delicious! When I think about it, I'm not sure that I've ever eaten a bowl of tomato soup without a grilled cheese sandwich to go along with it. Yumm! Thanks for the delicious recipe and thanks for the pin too! This looks so delicious. Perfect for a fall day. Come visit us. We have a terrific molten cocoa cake recipe and fat free sweet potato souffle to share.